When Women and Hollywood asked me if I wanted to do a couple of guest posts on horror movies, I jumped at the chance. Like Kerensa Cadenas mentioned in her introduction to the series, I have an abiding fascination with horror movies and the way they manage to articulate seemingly inarticulable fears. Unlike Kerensa, I liked them even when I was very young–some would say too young to have been watching them. Not only did my mom give in to my desire to see movies like Invasion of the Body Snatchers and Ghost Story in theaters before I was 10, my parents were also at the forefront of a technological revolution when they bought their top-loading VCR, giving me the chance to watch the R-rated movies I couldn’t see on my own and to plumb the depths of the history of horror. Much Hitchcock was watched on that VCR. My absolute favorite thing to do for my birthday was to have a slumber party and make all of my friends watch totally terrifying movies and then avoid sleep for as long as possible with me. (I later learned that I actually might have traumatized some of those devoted friends. My apologies.) A perennial favorite at these gatherings was the original Ridley Scott film Alien and its sequels. I rewatched the first movie recently, and you should, too. To appreciate the power of Alien, you’ve got to go back to 1979, to situate yourself at the end of a decade in which technological change had increased at a rate of Steve Jobs over Pong squared. Think floppy disks, microprocessors, jumbo jets, MRI technology, test tube babies, artificial hearts, and Apollo 18, the first joint-U.S. and U.S.S.R. spaceflight. Then, watch Alien. If you’ve seen it before, you’ll see it anew. If you haven’t seen it, the way in which it represents the anxieties, excitement and challenges of a decade will not date it but will rather add to your appreciation of a genuinely well-acted, well-told story. Scott, like most filmmakers, insists that he was just trying to make a good movie, and I don’t mean to imply that he was deliberately trying to represent the fear created by a scientific alliance between two Cold War enemies and all that that meant for the future of, you know, humanity. But artists are always inspired and informed by the world in which they live, and, seen in retrospect, this film spoke directly to the fears of its time. 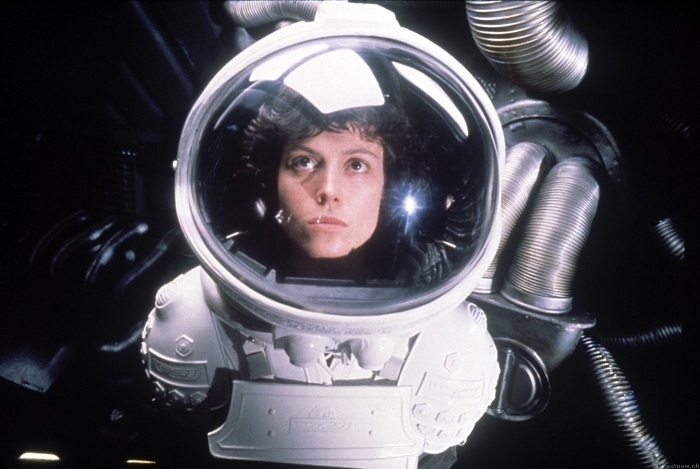 I rewatched Alien with two things in mind: The fact that the role of Ripley was intended for a man, and the idea that the film was, to some extent, about anxieties created by advances in reproductive rights. The truth is, I thought I’d come up with some brilliant insight that nobody had ever thought of before to offer you. But the fact is, the feminist scholarship on Alien is a whole library unto itself. From Freudian analyses that the movie’s central action of trying to expel an alien life form from a “ship” represents male anxieties upon being displaced from the process of reproduction, to Marxist interpretations of the anti-capitalist nature of the story, more things have been said about Alien than any blog post could ever best. 1.Does the layout of the ship–whose central processing unit is called “Mother” — remind you of anything? 2. Is the main idea of the movie that expelling a life form from your body should be difficult, or is it that the constraints of Authority are the only things that make it so? 3. Is the film grounded in women’s fears that they still may not actually be in control of their own reproductive systems, or men’s fears that now that abortion is the law of the land, the role they have to play in reproduction will be negated? 4. How would the movie be different if Ellen Ripley were a dude? 5. Does Sigourney Weaver getting mostly naked at the end negate the overall feminist premise of the film? Given the many interpretive possibilities of the film, you might not agree with me. So watch, decide what you think, and let me know. In fact, make this priority one. All other priorities rescinded. Holly L. Derr is a director, professor, and feminist media critic who writes about theater, film, television, video games and comics. Follow her@hld6oddblend or on her tumblr, Feminist Fandom.